Five of Rayola’s books in one volume! This beautiful volume is one that you will treasure for years to come. Establishing Our Life In Christ offers real “meat” to the hungry soul. This is the first volume of five separate books in a series of seven volumes that deal with different aspects, and levels, of the Christian walk. The books in Volume One address subjects that are vital to the proper establishment of the Christian life. The first book, My Words are Spirit and Life, will help the reader to “rightly divide” God’s Word, and benefit from it. The second book, The Anatomy of Sin, delves into the various influences, workings and activities of sin that will challenge believers to come back to center as to how God perceives sin according to His Word. 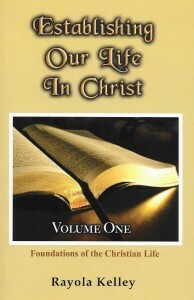 The Principles of the Abundant Life is the third book in this volume. Written to help the reader understand how the principles of God reveal important aspects about His character, it provides a simple presentation of how such principles are capable of producing godly living. The fourth book, The Place of Covenant, explains how the covenants of God affect and influence the Christian walk and testimony. The insights and inspiration in this book will thrill your soul. The final book, Unmasking the Cult Mentality, is an in-depth study of the logical explanations behind Christianity’s fundamental beliefs of faith that clearly separate it from the erroneous teachings of cults. This study will enable the believer to give an account of the hope that is in him or her, while avoiding coming under the indoctrination or influence of a cult mentality. This volume will prove to be invaluable to those who consider themselves serious students of the Bible.